What’s Going On At Air Food In Santa Monica? When a promising and plucky new French restaurant burst onto the scene early last year, I was hopeful that Air Food would be a new neighborhood favorite. But Downtown Santa Monica can be a tricky neighborhood. By all appearances, it looks like they have abandoned their location at 109 Broadway. Yelp is reporting them as temporarily closed, but the place is nearly gutted and… we’ve seen this before. This is a bit mysterious… What was formerly a short-lived Bobarrito at 1321 Third St. Promenade in Santa Monica has morphed into something called Pink Sushi. I’m not sure what’s going on here, but I’ll keep watching to see what develops. 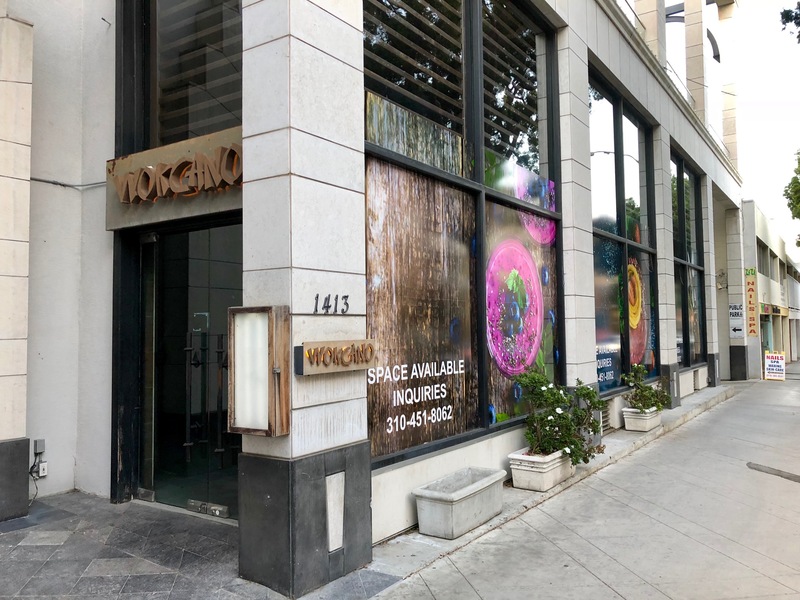 And while we’re on the subject of closures… I’m not sure when this happened, but I only recently noticed that Santa Monica’s popular sushi restaurant and after work bar scene Wokcano has quietly disappeared from its location at 1413 5th St. in Downtown Santa Monica. I’ll keep watching to see what hopeful contender may vie for the cavernous space.